George FM, Audiology Touring, PATO Entertainment and Fabrik proudly present global award-winning electronic act The Prodigy for the New Zealand and Australian tour in 2019 to celebrate the release of their new album ‘No Tourists’ to be released globally on 2 November 2018. 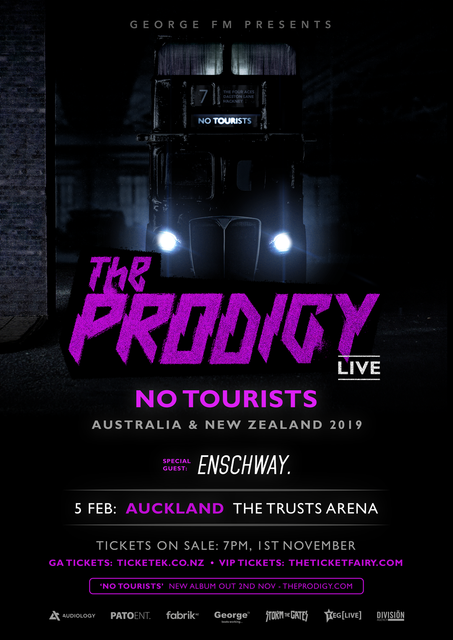 Tickets for The Prodigy’s New Zealand date at The Trusts Arena in Auckland on Tuesday 5 February 2019, will go on sale at 7pm Thursday 1 November 2018 through Ticketek. With six of the biggest and most influential albums in modern music today already under their belt, The Prodigy have consistently proved to be one of the most thrilling live bands in the world! Vital and vitriolic, on stage The Prodigy are a snarling force to be reckoned with, a maniacal beast of epic proportions. The Prodigy have clocked up a staggering six No. 1 albums in the UK including 1994’s ‘Music For The Jilted Generation‘ and 1997’s ‘The Fat of The Land’. Their latest offering ‘No Tourists’ is set for release on 2 November 2018. ‘Need Some1’ was the pounding debut single from the new album, a banger that features a classic house diva vocal sample from Loleatta Holloway. This was followed by ‘Light Up The Sky’ an attack of acid rock in which guitars combine with 303 mayhem, Maxim’s spitting vocal and an uplifting chorus from long-time contributor Brother Culture; a track that illuminates the urgency and danger that has continually defined The Prodigy throughout their career. The Prodigy will be supported by triple j unearthed DJ, Enschway. Fast becoming Australia’s ‘next big thing’ after an extensive run of solo shows, along with sets at Splendour in the Grass and the Listen Out festival. “We are looking forward to bringing No Tourists live to New Zealand in 2019. Once again, time to bring the rukus!” said Liam Howlett (The Prodigy).